I have an essay on conservation ready to go, with some discussion of how Europe deals with high gas prices. However, a couple of newsworthy items are worth commenting on. The Oil Drum beat me to the punch on Chuck Schumer’s grandstanding, but another article caught my eye yesterday. 2. Higher costs for reformulated gasoline. 3. The switch from MTBE to ethanol. He then goes on to attack each factor, trying to “prove” that the biggest reason for higher gas prices is none of these, but instead increased profiteering. However, Hamilton is certainly not telling the whole story. He is out to get the oil industry to satisfy a political agenda, and probably feels like the end justifies the means. But here is what he forgot to tell you. The oil industry has also blamed another factor, consistently and with good reason, since Hurricane Katrina struck. While the 3 factors mentioned above have played some part in higher gas prices, none of them are the biggest culprit. The biggest culprit is that refining capacity has struggled to keep up with demand since the hurricane. Gasoline inventories continue to fall week after week, despite the higher prices. That means that prices still have not been increased to a level sufficient to stem demand. As long as gasoline inventories continue to drop, prices will continue to go up. If they don’t, shortages will eventually result. 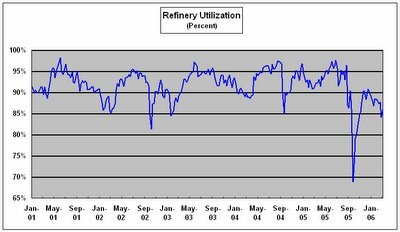 It is clear that we have yet to recover refining capacity to the level it was before the hurricane. What this means is that we have a problem with supply and demand, which means prices will rise as they are doing to prevent shortages. (What Chuck Schumer thinks it means is that refiners are deliberately withholding product from the market). Gasoline stocks are in free fall. Again, I have to wonder if Mr. Hamilton is completely ignorant of supply and demand. As long as the stocks continue to fall, prices will continue to rise. Now, nobody is denying that this has resulted in higher profits for oil companies. That is what capitalism is based upon: Supply and demand. It seems like many people do not understand basic economics. When someone has a resource, and demand goes up, prices will increase until supply and demand are balanced. If the resource was not scarce, then the supplier couldn’t raise prices, because someone else would continue to sell at a lower price, and could steal the customers. Hamilton and others have completely mixed up cause and effect. The cause of higher gas prices is not increased profiteering. The cause is very tight supply, with some contribution from the other factors mentioned above. The effect is that oil companies are making more money. “Oil companies are opportunistically using the rising world price for crude oil as an excuse to excessively raise gasoline prices and pump up their profits, even though the spot market price for crude has gone up far more slowly than gasoline prices,” said FTCR President Jamie Court. “In addition, the spot price is higher than most oil companies pay, since they either harvest their own crude or pay more stable and often much lower contract prices. And there we have the money quote. The FTCR wants to punish the oil companies for making money, and they want to funnel the money to a competing industry. They are using this misleading study to push their political agenda. Now, I am all for alternative energy. I have made that abundantly clear. But the ethanol industry already benefits from very generous subsidies, and the energy they produce is trivial with respect to the size of the subsidy. Yet somehow, the existing subsidies and mandates are still not enough. Shouldn’t that trigger a flag in people’s minds that something is not quite right here with ethanol economics? I would be willing to bet that >90% of the voters don’t understand why there is controversy surrounding the use of grain ethanol as a fuel. I bet the FTCR doesn’t understand the controversy. They think it is a good idea to punish oil companies and they think they know where the money should go. The person bankrolling this initiative , Vinod Khosla, is a major investor into the industries that would directly benefit if the initiative is passed (3). Doesn’t anyone see a problem with this? Isn’t there a conflict of interest here, which may prevent a much better solution from being enacted? Here is a man who stands to gain millions if he can just convince the voters to punish the oil companies and send that money his way. If you are going to pass a windfall profits tax, why not use the proceeds to give rebates for the purchase of very fuel efficient vehicles? Wouldn’t that be a far wiser use of the money, with immediate benefits? There is too little personal responsibility here. People can “punish” the oil companies by avoiding long commutes, buying a more fuel efficient vehicle, and reducing unnecessary driving. The FTCR would instead absolve people of their personal responsibility and blame it all on the oil companies. But the reason oil companies are so profitable is that the American public has an insatiable appetite for energy. Shifting money from one industry to another – especially one as inefficient as the production of alcohol from grain – is not the answer. The results will be less money for capital projects, which will lead to fuel shortages and ever higher prices. Didn’t we learn that the last time around? 3. “Valley man bankrolls clean-energy initiative.” The Mercury News, April 3, 2006.